Belize NMS: A gradual increase in moisture is expected during the next couple of days. General Outlook: Cloudy skies with a few showers and thunderstorms mainly over southern and some coastal areas during Thursday, then over most areas Thursday night. Today E-SE 10-20 kts Moderate-Rough 4-6 ft A FEW SHOWERS OR THUNDERSTORMS MOSTLY NORTH. Tonight E 10-20 kts Moderate-Rough 4-7 ft SOME SHOWERS AND THUNDERSTORMS. Tomorrow E 10-20 kts Moderate-Rough 5-7 ft A FEW SHOWERS AND THUNDERSTORMS MOSTLY SOUTH. On Ambergris Caye this morning the wind is from the East and decreasing from 10 mph. the sea is calming and it looks as if the boats are going out. Our expected high is 88f. It would be nice to see the rain that has been forecast for yesterday and today but nothing yet. There is a lot of activity around us but not on Belize. The tropical activity has got higher up and is well in the Gulf, but where its clockwise outflow is going down the west Caribbean sea, it is clashing with the easterly Caribbean wind causing a front line which is producing rain. This may effect the Yucatan, but at present does not show as if it will get to Belize. To me, there appears to be a Tropical Storm developing out in the Pacific, which could effect SW Mexico. The odd thing is this is more intense than that earlier one they foretasted all sorts of things happening, but this one they are not mentioning at all. This one may well fizzle away today. But the whole area is putting a lot of high cloud over or around Belize. Looks as if there will be significant sunshine between the clouds as the thin this morning, a chance of rain. The rainfall summary for May 2017 shows that with the exception of Rio Bravo and Tower Hill located over the northwestern Orange Walk districts, most areas of the country recorded below normal rainfall for the month. Areas with driest conditions were central coastal areas. That is coastal Belize and Stann Creek Districts. 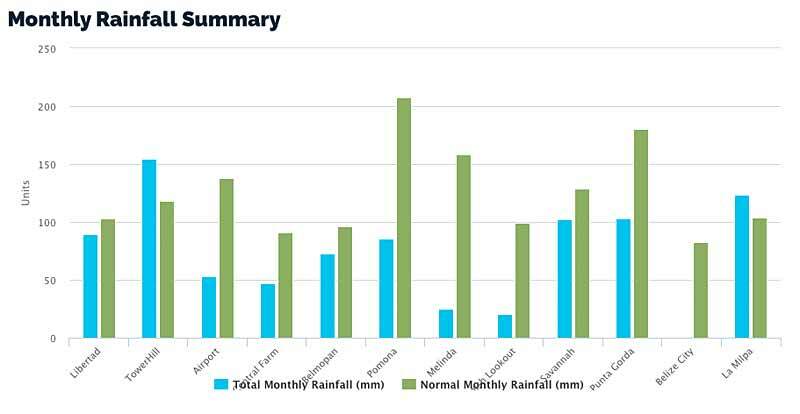 The deficit in rainfall was likely due to a slow start of the rainy season which normally commences in mid to late May over the south and gradually make its way north by the end of May into Early June. The maps below show the total rainfall recorded at some key stations and how that total compares to the normal for the month of April. A similar comparison is shown by the bar graph that compares the recorded total for May 2017 againt the climatological norm for the month. 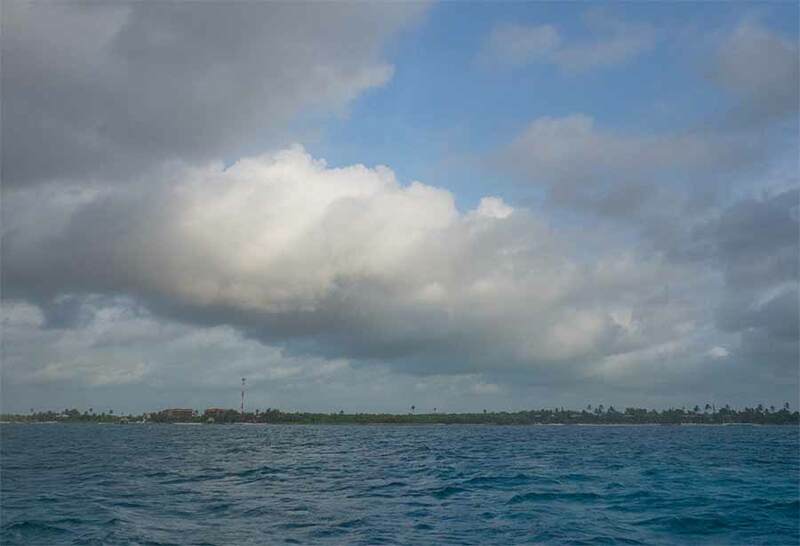 THE MONTH OF MAY STARTED WITH MAINLY FAIR, WARM AND DRY WEATHER WITH AN EAST TO SOUTHEASTERLY SURFACE FLOW OVER BELIZE AS THE NORTH ATLANTIC HIGH PRESSURE RIDGE EXTENDED INTO THE NORTHWEST CARIBBEAN AND DOMINATED THE AREA. RIDGING WAS NOTED AT THE UPPER LEVELS FOR THE FIRST THREE DAYS WITH RELATIVELY LOW AMOUNTS OF MOISTURE, RESULTING IN ONLY ISOLATED SHOWERS OVER THE COUNTRY. A COLD FRONT WAS LOCATED IN THE CENTRAL GULF OF MEXICO THAT PREGRESSED EASTWARD. AS THE COLD FRONT APPROACHED THE AREA, CONDITIONS BECAME MORE FAVORABLE FOR SHOWERY ACTIVITY AS MOISTURE AND INSTABILITY INCREASED OVER THE AREA. ON MAY 4TH, INTENSE THUNDERSTORMS DEVELOPED OVER THE MAYA MOUNTAINS LASTING FOR OVER TWO HOURS AND PROGRESSED ON A SOUTHWESTWARD PATH BEFORE DISSIPATING LEAVING BEHIND DENSE CIRRUS CLOUDS STREAMING OVER THE AREA. CLOUDINESS AND MOISTURE INCREASED OVER THE AREA DUE TO THE COLD FRONT LOCATED OVER LOUSIANNA AND EXTENDING DOWN INTO THE BAY OF CAMPECHE. A FEW SHOWERS AND THUDERSTORMS OCCURED ON MAY 5TH OVER THE CENTRAL AND NORTHERN AREAS OF THE COUNTRY ASSOCIATED WITH A PRE-FRONTAL TROUGH TO THE EAST OF BELIZE SUPPORTED BY AN INCREASE IN MOISTURE LEVELS OVER THE AREA WITH THE LATEST PWAT VALUE BETWEEN 55-60MM AND A DIVERGENT UPPER LEVELS DUE TO AN UPPERL LEVEL TROUGH OVER THE COUNTRY. A NORTH TO NORTHWESTERLY AIRFLOW PREVAILED OVER THE AREA AND SHOWERS AND THUNDERSTROMS SPREAD TO MOST AREAS AS THE COLD FRONT CROSSED THE COUNTRY OVERNIGHT AND REMAINED STATIONARY OVER THE GULF OF HONDURAS AND SOUTHERN BELIZE. WEATHER CONDTIONS IMPROVED OVER THE COUNTRY OF MAY 7TH AS THE UPPER LEVELS WERE CONVERGENT, MOISTURE LEVELS DECREASED AND RIDGING DOMINATED THE AREA RESULTING IN SUBSIDENCE AND SUPPRESSION OF CONVECTION. SIMILAR WEATHER CONDITIONS PREVAILED OVER THE COUNTRY FROM THE 8TH TO THE 11TH OF MAY WITH A RIDGE AT THE UPPER LEVELS IN A CONVERGENT PATTERN IN DRY LOW LEVEL CONDITIONS IN AN EAST TO NORTHEASTERLY AIRFLOW VEERING TO THE SOUTHEAST. ONLY ISOLATED SHOWERS WERE OBSERVED OVER THE COUNTRY DURING THIS PERIOD. THIS DRY SPELL WAS INTERUPTED BY A LATE SEASON COLD FRONT WHICH RESULTED IN ANOTHER INCREASE AND CLOUDINESS AND MOISTURE OVER THE COUNTRY FROM THE SURFACE THROUGH TO THE MID-UPPER LEVELS. 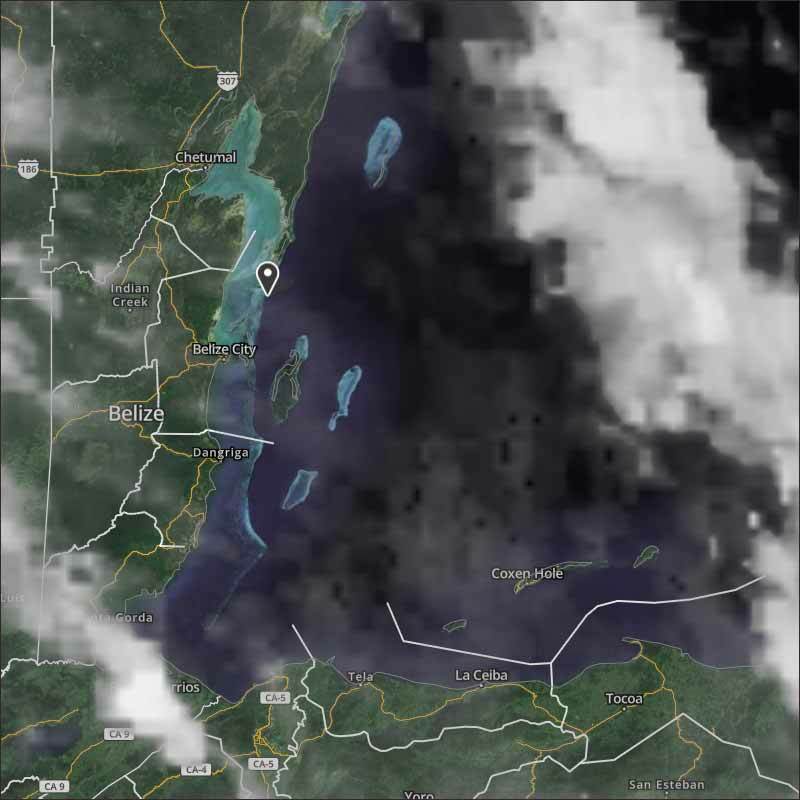 CONDITIONS BECAME WEAKLY DIVERGENT AT THE UPPER LEVELS AND A FEW SHOWERS AND THUNDERSTORMS DEVELOPED OVER THE MOUNTAINS AND SOUTHEAST BENQUE VIEJO ON MAY 12TH AND OVER CENTRAL AND INLAND AREAS ON THE 13TH WITH VERY INTENSE THUNDERSTORM ACITIVITY (YELLOW BAND) DETECTED ON RADAR IMAGERY. SHOWERY ACTIVITY INCREASED OVER THE COUNTRY ON THE 14TH AND 15TH WITH SOME SHOWERS, PERIODS OF RAIN AND A FEW THUNDERSTORMS OBSERVED OVER MOST AREAS. THIS ACTIVITY WAS FURTHER ENHANCED BY A TROUGH OVER THE YUCATAN PENNINSULA, A COLD FRONT EXTENDING INTO THE BAY OF CAMPECHE AND A BROAD AREA OF LOW PRESSURE WHICH DOMINATED CENTRAL AMERICA AND THE WESTERN CARIBBEAN. A LIGHT WEST TO NORTHWESTERLY AIRFLOW PREVAILED OVER THE AREA. RECORD LEVELS OF PRECIPITATION WERE OBSERVED ON THE 15TH OVER THE NORTH AND SOUTHEAST COAST WITH HIGHEST RAINFALL VALUES RECORDED IN ORANGE WALK (54.4MM), TOLEDO (33.4MM) AND COROZAL (26.4MM). SKIES BECAME PARTLY CLOUDY TO CLEAR AS THE ATMOSPHERE BECAME DRIER AND MORE STABLE OVER BELIZE. IN SURROUNDING REGIONS LIKE THE YUCATAN AND THE NORTHWEST CARIBBEAN, TROUGHING WAS OBSERVED AT THE LOW AND UPPER LEVELS WHILE A DEEP RIDGE WAS OVER MEXICO AND BELIZE. HOWEVER, THE NORTH ATLANTIC HIGH PRESSURE RIDGE WAS THE DOMINANT FEATHER OVER THE AREA AS IT EXTENDED INTO THE NORTHWEST CARIBBEAN. THEREFORE, SHOWERS WERE ISOLATED EXCEPT FOR A THUNDERSTORM THAT OCCURED OVER THE WESTERN BORDER AND OVER GUATEMALA ON THE AFTERNOON OF THE 18TH AND 20TH. THE WINDS AT THE UPPER LEVEL HAD A WEST TO NORTHWESTERLY COMPONENT DUE TO THE UPPER LEVEL TROUGH TO THE EAST OF BELIZE, WHILE AT THE SURFACE, A LIGHT EASTERLY AIRFLOW PREVAILED. ON THE 21ST AND 22ND, A FEW PASSHING SHOWERS AND ISOLATED THUNDERSTORMS OCCURED OVER THE NORTHERN AND INLAND PORTIONS OF THE COUNTRY AT FIRST, THEN OVER CENTRAL AND SOUTHERN AREAS AS A RESULT OF A TROUGH LOCATED IN THE BAY OF CAMPECHE AND RESULTING INCREASES IN UPPER LEVEL MOISTURE AND PWAT NEAR BELIZE. THE SURFACE WINDS BECAME A BIT GUSTY WITH AN EASTERLY AIRFLOW DURING THESE DAYS. AS THE MONTH NEARED ITS END, CONDITIONS BECAME FAIR, DRY AND HOT OVER THE COUNTRY WITH RIDGING OVER THE CARIBBEAN AND A MODERATE EAST TO SOUTHEASTLY FLOW. SHOWERS WERE ISOLATED OVER INLAND AREAS DUE TO DAY TIME HEATING. ANOTHER LATE SEASON COLD FRONT WAS LOCATED IN THE CENTRAL GULF OF MEXICO AND THE BAY OF CAMPECHE ON THE 24TH WHICH RESULTED IN CONDITIONS BECOMING CLOUDY AND MORE UNSTABLE OVER THE REGION. STRONG COVECTIVE ACTIVITY WAS AHEAD OF THE COLD FROM THAT RESULTED IN STRONG THUNDERSTORM ACTIVITY OVER THE INLAND AREAS OF BELMOPAN, SPANISH LOOKOUT AND BENQUE VIEJO RESULTING IN STRONG WINDS OF 37 AND 39 KNOTS IN BELMOPAN AND BALDY BEACON AND 16MM OF RAINFALL. A TROPICAL WAVE WAS ALSO LOCATED 87 W SOUTH OF 18N WHILE THE UPPER LEVEL PATTERN WAS DIVERGENT AND CONVERGENT AT THE LOW LEVELS.